What happens to your website when people are looking at it on a smartphone? Does it stay the same? Do your images load? Are your tabs still clear? Does the information present as it should? Is the content teeny-weeny, requiring you to zoom in 300%, just to make it readable? If you haven’t asked yourself these questions (or, better yet – checked for yourself! ), you should. And why is that? The answer is simple: Because smartphones and tablets are becoming more ubiquitous in playing a part in consumer spending. Accordingly, so too grows the need to have a mobile-friendly website. That’s what we’re talking about when we use the words responsive web design: your website’s ability to transition to fit on a desktop, tablet, or mobile phone. Websites that have been built with responsive design, attempt to make this transition seamless and effective; they allow their users to access the site as easily as if they were on a desktop. Websites that have been built without responsive design in mind do not, and are often a huge burden to navigate. In other words, a reason for your customers to look the other way. Again, the answer should be obvious. More and more people are making purchases from their mobile phones. 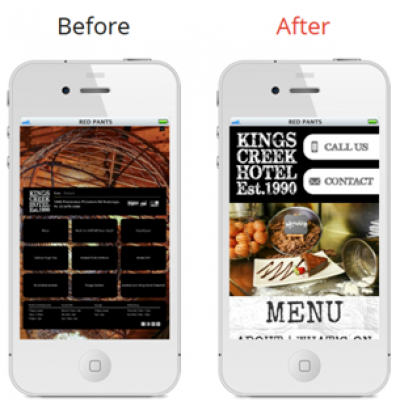 If your website isn’t optimised for mobile viewing, people won’t buy from you. If you cringe at the thought of your normal website not working properly on someone’s desktop, why wouldn’t you cringe at your website not working properly on someone’s smartphone? After all, the smartphone and tablet are fast surpassing the laptop. Even for shopping! At the current growth rate, tablet and smartphone website visits will account for 50% of all e-commerce visits by the end of 2014 (fitforcommerce.com). 87% of smartphone and table owners use a mobile device to shop (fitforcommerce). 65% of mobile users said they used their mobile device to find a business to make an in-store purchase (Google, 2011). It is predicted that, by 2015, mobile shopping will account for $163-billion in sales worldwide. Whilst there are numerous benefits to a responsive mobile web design, consumer's mobile use and expectation has moved beyond responsive. You might regard responsive as a minimum prerequisite to browsing. Responsive design can present content that is squished and can be slower to load. The content on your desktop site may be in part, irrelevant to the smart phone user. So how can you convert your browsers to buyers? Dedicated mobile friendly websites retain the look and feel of your desktop site but include only the vital content that your smartphone audience needs. In fact, savvy marketers are ditching responsive because a dedicated mobile website is designed purely for mobile users in mind. Clear call to action, larger one-tap buttons (Click-to-call, store locators) and dynamic and relevant content deliver a fast and convenient experience to the consumer. According to Google 81% of mobile web searches are driven by speed and convenience. The trends are clear: mobile usage, and more importantly mobile spending, is on the rise. While this doesn’t mean that conventional desktop online shopping will cease entirely, it does mean that your website’s mobile design is increasingly important. If you haven’t already setup your website to be design responsive or perhaps built a dedicated mobile friendly website, do yourself a favour and make sure your website is delivering outcomes across desktop, tablet, and mobile.